The Kodi Media Center gained notoriety in the past two years as a platform for piracy. The Kodi Foundation has actively worked to distance itself from and discourage the use of its app for piracy. However, it appears the roughly one-year-old anti-piracy coalition, Alliance for Creativity and Entertainment (ACE), has been far more effective at taking the steam out of what was a quickly-emerging Kodi piracy scene. Part of the decline in Kodi piracy may also be attributed to anti-piracy legislation in the EU and the UK, as well as bans on Kodi boxes in online marketplaces like Amazon and eBay. 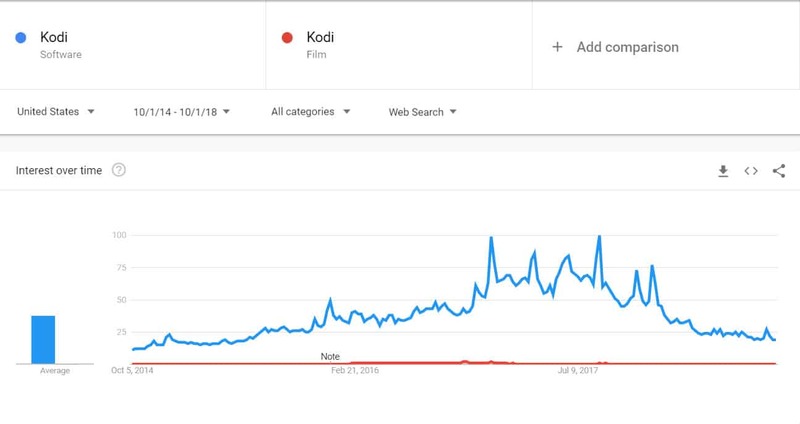 Based on our research, interest in “Kodi” as a search term has fallen over 80 percent from 2017 to 2018 (as measured from August 2017 to August 2018). Google Trends data reveals the dramatic decline started in Q2 of 2017 and has, for the most part, continued that trend up to this point. There’s also the possibility that Google’s removal of “Kodi” from autocomplete search results had a marginal impact. This occurred in late March of 2018, but there’s no way to effectively track the results of this action. Additionally, most of the volume decrease we’ve observed had already occurred by the time Google took this action. Taken together, each of these events likely worked to create an overall reduced level of search activity related to Kodi as a whole, and in particular Kodi-related piracy. The decrease in search numbers likely also means a reduction in Kodi-related piracy, although how much of that relates to consumers turning away from piracy to legitimate sources is unclear. Google Trends is a tool Google created to help provide insights into the way users are searching the internet through their platform. When you type in a search term in Google Trends, such as “Kodi”, Google’s tool looks at the volume of searches for that term across different regions. It then compares those volumes across the given time frame and gives each point in time a score between 0 and 100. The higher the score, the more people searched for that term on that date. Additionally, Google Trends compares different countries and regions using a similar scale. However, between regions, the ranking is proportional to other searches from that region. As such, the larger a region’s score on the 0-100 scale, the larger its proportional search volume for the term. The Alliance for Creativity is an anti-piracy organization that was officially launched on June 13, 2017. With big-named members such as Netflix, Amazon, HBO, NBCUniversal, Sky, BBC, Disney, and many more, it’s quickly become a force to be reckoned with. 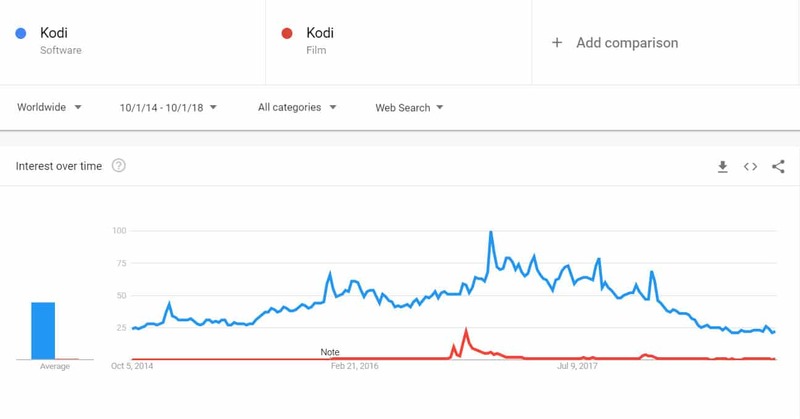 Between August 2014, when Kodi 14 was announced, and June 2017, when ACE was launched, the volume of searches for “Kodi” rose more than 2,600 percent. While some of this jump in interest could be attributed to the overall usefulness of Kodi as a free and legal media player, piracy associated with Kodi was the single largest driver of that search volume increase. Even as ACE launched, another major event occurred in the third-party Kodi community. On June 5, 2017, TorrentFreak reported that Dish Network launched a lawsuit against one of the biggest names in Kodi’s piracy scene at the time, TVADDONS.ag, as well as a popular (at the time) third-party addon, ZemTV. Both TVADDONS and ZemTV had seen growth in interest following the release of Kodi (renamed from XBMC, or Xbox Media Center, in 2014). TVADDONS, in particular, experienced a notable amount of search volume growth prior to the Dish Network lawsuit. The Dish Network lawsuit appeared to do considerable damage to TVADDONS. In the year since the lawsuit and the associated anti-piracy actions taken by other sources, TVADDONS has never fully recovered. After TVADDONS’ original site was seized, it’s struggled to regain the same level of volume it once enjoyed thanks in no small part to the piracy scene. But it was the actions ACE began to take against third-party Kodi addon developers that took the vigor out of what was a fast-growing Kodi piracy movement and has likely helped stymie TVADDONS’ ability to fully restore what it lost. ACE’s impact on Kodi-related piracy is likely more than circumstantial, based on the evidence, but other changes occurred in the past two years that may have also led to a decrease in the number of consumers turning to Kodi for piracy. A major element in the Kodi piracy scene was “Kodi boxes”, which were typically Android-based TV streaming devices loaded with Kodi software and pre-installed with third-party Kodi addons. Many of these devices were available from online marketplaces such as Amazon and eBay. But in 2017, Amazon, eBay, and several other marketplaces banned Kodi boxes from their platforms. In a few major regions where Kodi is popular, new laws may have impacted how many consumers were willing to resort to Kodi-related piracy. In April 2017, the EU passed a new law (pdf) that made it illegal to sell media devices that easily enabled multimedia piracy, such as “fully-loaded Kodi boxes.” That ruling also made it illegal to stream copyrighted material from unofficial sources. In the UK, the Digital Economy Act 2017 passed into law in late April. Among other things, the law makes it illegal to stream copyrighted content from illegal sources, and tacks on a maximum 10-year prison sentence for offenders. Noticeable declines in Kodi-related search traffic followed what appears to have been a rather active anti-piracy push from April to July of 2017. We’re now over a year outside of ACE’s formation and the start of its covert cease-and-desist letter operation against Kodi addon developers. Not much is currently known about how ACE works or gathers enough personally-identifying information about people in order to pinpoint who to send letters to. However, it’s clear that ACE is using various anti-piracy and copyright laws, such as the Digital Millennium Copyright Act, to support the legality of its letters. As well, their efforts have so far made an impact when looking at the decrease in search volume for Kodi-related topics. The result has been a steep decline in search interest for the term “Kodi” and other Kodi-related topics often associated with piracy through the software. ACE’s actions have impacted many of the more well-known third-party Kodi addon developers, a large number of whom quietly left the scene under a cloud of speculation. Many of the common search terms that include “Kodi” have diminished. The number of popular and heavily promoted third-party addons and sources has slowly dried up. Over the course of the months following the formation of ACE, dozens of third-party Kodi addon developers and development teams removed their presence from social media (primarily Twitter), including Noobsandnerds, Teverz, and SpinzTV. Additionally, many popular repositories for downloading addons, such as SuperRepo, Colossus, and Simply Caz, were shut down, at times without much word from the sources behind them. He later explained that he wanted to instead concentrate on being a husband and a father. For ACE and major Hollywood copyright holders, the response could not have been better. Not only did addon developers leave in droves due to the threat of legal consequences, but the ripple effect on other developers choosing to leave their infringing addons behind was also an effective end result. The letter appeared to be from a corporate attorney representing ACE. The letter calls out JSergio123 by name (redacted by JSergio123). It also includes information that says ACE will not pursue a lawsuit against the developer if he signs an agreement to stop producing infringing addons. ACE’s strategy has not killed the third-party development scene, however. Instead, it appears to have driven many developers underground. Where some used to turn to Twitter, many now rely more heavily on more secure messaging options such as Telegram. And where new addons used to get promoted heavily on social media and YouTube, most are now more regularly talked about in smaller, less-well-known third-party forums, such as the subreddit /r/Addons4Kodi. Indeed, even as the volume of most major Kodi-related search terms were reduced to 2015 and 2016 levels, those consumers determined to utilize Kodi for piracy are still active. In some cases, certain third-party addons are growing in popularity. Even as once-popular addons such as Covenant went offline, others, such as Placenta, Incursion, Gaia, Exodus Redux, and Masterani Redux have gained interest. However, in a post-ACE world, newer third-party addons have failed to draw the same level of attention as some of the heavy-hitters in the past, such as Exodus or Covenant. Comparative search volumes for these newer addons are far less than what the most popular third-party addons were receiving prior to the 2017 decline. Google Trends search volumes are difficult to parse without specific numbers. And while it’s obviously challenging to pinpoint exact data from several years ago, there are some figures we can point to. On April 17, 2017, just a few weeks before the house of TVADDONS’ founder was raided by company executives following a much-debated Anton Piller order, the site boasted about the large amount of traffic it was receiving in a TorrentFreak article. 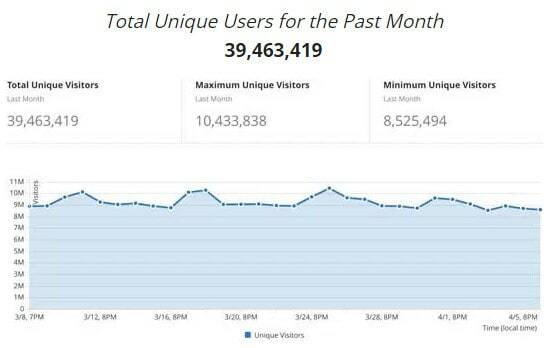 According to TVADDONS, the site experienced its best month for unique traffic ever during that March–April period in 2017. The data TVADDONS supplied to TorrentFreak shows the site had over 39 million unique users from March 8, 2017, through April 5, 2017. Based on our pulled data from Google Trends, it’s quite likely a good portion of that traffic was coming from organic search engine results. What this shows, ultimately, is that some Kodi-related terms drew in tens of millions of searches at the height of Kodi piracy in 2017. Enough, in fact, to likely result in tens of millions of Kodi users turning to pirate addons, and to easily draw the attention of copyright holders eager to stem the tide of Kodi-related piracy. As might be expected, Kodi is not commonly used in every country around the world. It’s also difficult to track down exactly how many people in each country might be using Kodi, whether for piracy-related reasons or for legitimate purposes. Google Trends does provide some information regarding where Kodi is comparatively more or less popular, however. The tool also adds some further insights into how anti-piracy movements in the past year have impacted Kodi’s popularity in key markets. In 2014, the year in which XBMC become known as “Kodi,” the newly-renamed media player was most popular in Europe, with Albania taking the top spot for search volume. 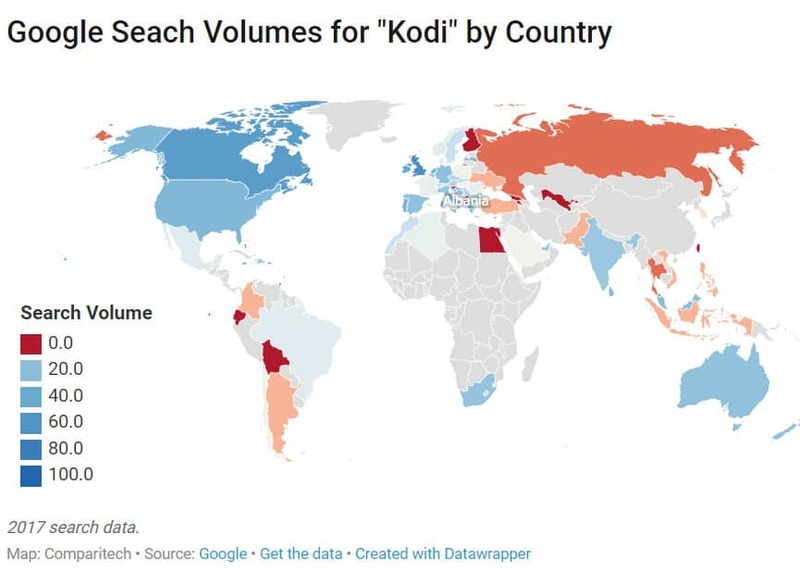 Almost across the board, countries where there was some interest in Kodi in 2014 showed notable or very significant search interest growth by 2017. After the large anti-piracy push starting in the middle of 2017, Kodi search interest started to wane. By this time of writing, the drop in search volume has impacted almost every region where interest saw growth between 2014 and 2017. 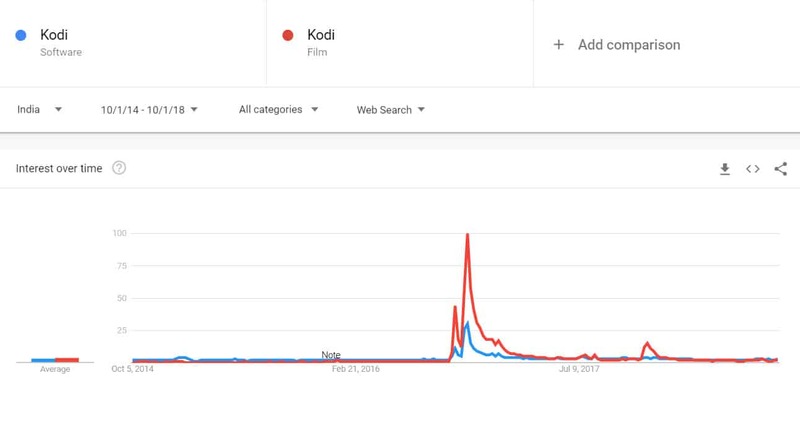 The chart below shows how volumes changes for searches for “Kodi” between 2016 and 2018. A longer line represents a larger change in volume position, based on Google Trends’ 0-100 scale. In Trinidad and Tobago, the UK, Puerto Rico, and Ireland, that decrease was around 50 percent of 2017 search volume levels. And for Canada and the US, around 30 percent of the search traffic volume dropped off. In Jamaica, the search volume for Kodi completely dropped off the radar. 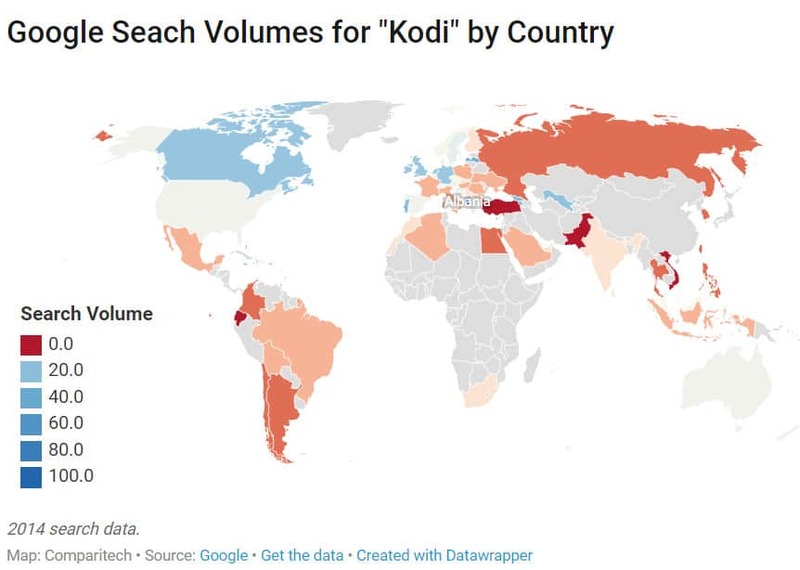 Where it was among the top 10 countries for Kodi search volume in the 2017 time frame, in 2018, there was so little traffic that Google no longer measured enough activity to include Jamaica in its Trends result. Where did Kodi-related piracy go? In some cases, it’s possible that those who turned to piracy through third-party Kodi addons were scared away from it. Particularly in the case of the EU and the UK, in particular, where streaming from pirated sources was made a crime, some pirates may have decided the risk simply wasn’t worth it. However, many pirates these days turn to secure methods, such as hiding their activity behind VPNs, to evade detection. As such, many likely instead reverted back to more commonly-used piracy sources, such as torrenting from sites like ThePirateBay. As stated earlier, some pirates are still using Kodi for piracy, but are doing so more under-the-radar and gathering information via smaller piracy-focused forums and private, encrypted channels. What may also be true, however, is that some of those who chose to pirate through Kodi have turned instead to increasingly popular illegitimate IPTV services. Even as interest in Kodi—and therefore, Kodi-related piracy—has waned, interest in IPTV and “Free IPTV”, in particular, has increased. Kodi still commands a fairly large amount of search volume, especially compared to “free IPTV.” But unlike Kodi, IPTV as a term has seen a steadier, mostly uninterrupted growth. As with Kodi, IPTV itself is not directly associated with piracy. But the term “IPTV” is more commonly used among those using pirated IPTV services, just as the term “Kodi” is more popular among those using the media player for pirated streaming. The steady growth of illegal IPTV, as well as the increasing growth in the term “free IPTV,” reflects the fact that illegitimate IPTV options have either been less of a focus for anti-piracy organizations such as ACE, or could be a more difficult target to snare. Regardless, illegitimate IPTV continues to grow, offering pirate streaming options at a fraction of the cost compared to legitimate cord-cutting services such as Sling TV, fuboTV, or YouTube TV, and even further below the cost of traditional cable. How did Kodi become a haven for online piracy? When former US President Bill Clinton signed the Digital Millennium Copyright Act into law in 1998, a chief aim of the new legislation was to fight internet piracy. From Hollywood to Atlanta to New York, copyright holders nationwide praised the newly-minted DMCA as the next step to help fight the growing threat of piracy in a digital age. Fast forward to August 1, 2014. On a little-known website, an equally little-known developer named Nathan Betzen published a small article about his team’s newest software: Kodi 14.0 Alpha, a media player designed for Windows computers. The media player, a heavily updated and renamed version of the team’s much-loved Xbox Media Center (which was itself formerly Xbox Media Player) had already gone through many versions. Still, at that point, few internet users knew about it. In the span of just two years, Betzen and the Kodi/XBMC Foundation team would see the popularity of their software rise exponentially. And unfortunately, that interest and popularity was driven not because of marketing on Betzen’s part, but because of copyright pirates taking advantage of Kodi’s ability to easily scrape websites for streaming links and display them in the media player through Python-based addons. To be fair to Betzen and his team, neither Kodi nor XBMC were designed for piracy. Even today, the Kodi Foundation does an excellent job of distancing itself from the third-party piracy scene, going as far as to rigorously stamp out any talk of pirating and illegal activity from its on-site forum and Reddit page. But as much as the Kodi Foundation pushes back against piracy, its dedication to keeping its software open source and free to use created a haven for content pirates. In one of the software’s more recent updates, the Kodi Foundation even went as far as to add in an Android-style “Unknown Sources” system that disallows installation of plugins from outside of the official repository. As with Android, users can go into the settings and switch on the option to install plugins from unknown sources. The Foundation also recently pushed for and advocated for copyright holders to work with their system. Recent updates added Digital Rights Management (DRM) support, a clear indication that the Kodi Foundation wants companies like Netflix, Amazon, and others to add support for their software. Such support would add credibility to the media player’s ultimate goal of being an all-in-one interface for video streaming, something most consumers want considering a majority say there are too many streaming services on the market. 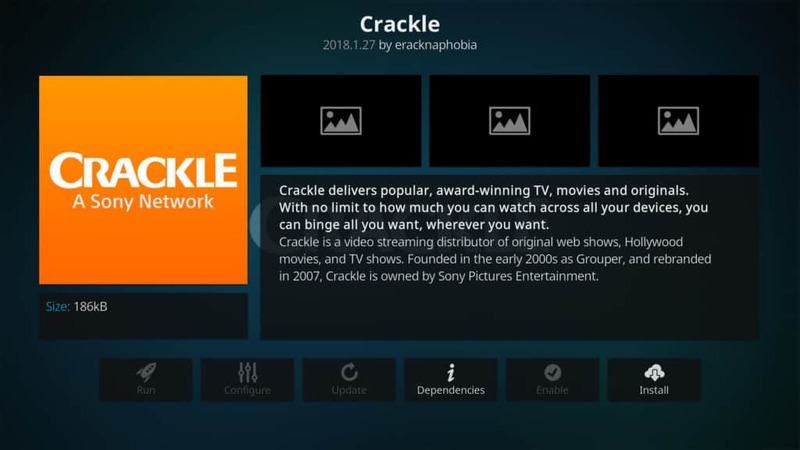 Crackle add-on, available in the official Kodi add-on repository. Nevertheless, over the intervening years between the release of Kodi 14 and the current anti-piracy push from ACE, online marketplaces, and governments, piracy has firmly rooted itself into Kodi’s community. Without an outright rejection of open source, that’s unlikely to change, making Kodi-related piracy a static issue, even if anti-piracy efforts continue to effectively reduce its overall impact. And even in the unlikely scenario that the Kodi Foundation decided to ditch the software altogether, the open-source nature of the app means any developers can (and already have) continue to fork the code for their own purposes. This information adds a good level of confidence to our results, although it does show how Google Trends data may often need some disambiguation in order to effectively parse and be used to draw conclusions. It also shows some of the notable limitations in using Google Trends data in some cases and reveals the importance of filtering for regional differences in search terms. Wow, what a brilliant and insightful article! !0 out of 10 for that one. Or even better, a High Distinction! I have been following the Kodi scene for a while now [2016-2018], and exactly as mentioned in your article, it all went very quiet there – didn’t it? As such, I feel your article accurately and believably accounts for that eerie silence that erupted during and after the demise of kodi. Yes, stupid developers, prancing around shouting, “aren’t I great – look what I’ve done!” Well, did anybody ever tell those ego driven nieve’s that expulsing yourself all over the internet with names, handles, emails, contact info or forum group details – let alone twitter postings everywhere you look; would allow even a blind, deaf, and dumb man to find/track you down? Now they hide! In there ‘what’s app’ encrypted message rooms, Ahhh, a bit late folks. Obviously these guys had no criminal backgrounds – regardless of the fact that they were at the height/heart of massive illegality! And such a shame. Such promising possibilities thrown down the drain. Kinda reminds me of a innocent child who is granted a huge inheritance, only to have it taken away by those who have the skills to remove such treasure, and use such wealth [content sales, distribution etc.] for their own ends and profits. Regardless, I weep for kodi, and the developers. Me? I’m a long haul sort of individual. In regards to the whole kodi scene, I love the idea [the dream] and the technology part also really stimulates me – cognitively! So let the mainstream ‘puff in the cloud’ streamers run away to mommy and get a Netflix account. Good riddance to them. Usurpingly, in kodi’s forlorn future, I’ll be there, applauding and admiring……….